The website loading speed at any given point is quite important. If you don’t want to lose customers through a bad browsing experience, then you have to invest on a hosting service that guarantees high performance and high speed. Cloud SSD hosting is perhaps the best option for people looking for quick and reliable websites. This will ensure that your website loads quicker anytime regardless of the traffic. Uptime is the measure of how often your website or blog will be live online. Some of the best hosting companies in the world offer a 99% uptime guarantee and while that is definitely good, you cannot afford to lose even 1% in uptime especially if you have a lot of web traffic. The least you should get is 99% and nothing less. This will ensure that your website is always online for all your clients. At BGOcloud, we value our clients’ businesses and we realize how important uptime is. That’s why we always strive to provide our customers with maximum uptime. 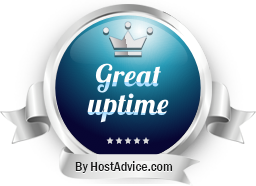 In fact, we are glad to announce that our company has received ‘’Great Uptime’’ award by HostAdvice. The internet is good but it’s also risky. With the rising number of hackers and malware, it is very important to go for a hosting company that has advanced data security features. In addition to this, the hosting package you choose should offer enough disk storage for your site and additional data backup storage in case of any eventualities. By definition, scalability is simply the ability of a hosting firm to adapt to the changing needs of a website or a blog. In other words, the hosting company should grow with you all the time. The company must be able to handle fluctuating traffic and the kind of pressures it brings without any problem. 24/7 support is also a big advantage because you are sure that in case you have any technical difficulties with the website someone will help you out immediately. There is no doubt glitches often occur and if you take time to deal with the issue you may end up losing out. But with 24/7 support, you will be fine. Choosing the best wordpress hosting is often a step by step process that requires a lot of care.